In the world of "foot supports" there typically exists two types of supports. One of these is arch supports that you purchase in drug stores, supermarkets, magazine ads and on the internet. The vast majority of these items are no better or more supportive than the innersole that comes with a pair of sneakers. They are basically a one size fits all in terms of attempting to be all things to all foot conditions. That left prescription orthotics which are custom made to the patient's foot structure, usually through a plaster of paris impression of the individuals feet, which is then sent to an orthotic lab which fabricates the orthotics according to the doctor's instructions. click here to see how my lab makes a prescription orthotic. As you can readily see, there is a lot of science that goes into making prescription orthotics. Depending on the patients problem a prescription orthotic may be constructed out of any number of different materials and thickness. Orthotics can be built to be worn in every shoe from a work boot to a women's high heel shoe. Many different types of padding can be built into a prescription orthotic in an effort to further control the particular problem and alleviate pain. Prescription orthotics are built (posted) in such a manner to re-balance the foot relative to the ground. The major problem here is cost which for many individuals can be prohibitively expensive (anywhere from $300.00 to over $600.00) unless they are covered under insurance. Unfortunately in the managed care times we live in, less and less insurance companies are covering prescription orthotics. Fortunately, there is now a third option. Recently KLM labs, a nationally recognized orthotics lab came out with their own "medical grade over the counter" orthotic. The beauty of this device is that the KLM FULL LENGTH ORTHOTIC is made of the same material that prescription orthotics are made of. They are medical grade orthotics. The "poly grade" shell (1) allows for optimum support without the bulkiness of store bought arch supports which means it will fit in a greater variety of shoes. Most devices sold in stores attempt to cushion the problem away, but as any foot specialist will tell you, it is the support afforded by the "poly grade" shell that puts the foot in a more proper alignment which allows for better foot function and alleviation of pain. Additionally, the KLM ORTHOTIC has other characteristics of a prescription orthotic that separates it from arch supports found in drug stores including intrinsic (internal) posting which further balances the foot, (to reduce pronation), a medial wedge (2) which helps take the pressure of the orthotic off the bottom of the foot and automatically adjusts itself to the arch height of a particular foot. In other words the medial wedge bends upward on the inside portion of the shoe so that people with high arched feet will feel support which is usually a problem in non-prescription orthotics. This medial wedge also works with the "poly grade" shell to better support the foot. You will not find this in most pre-made orthotics. 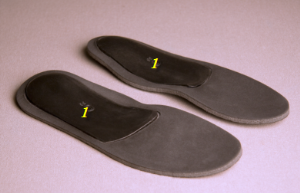 The orthotic also exhibits what is known as a deep heel seat (3) which helps stabilize the heel from the point the heel hits the ground until the foot lifts off the ground which keeps the foot in a better aligned position and helps absorb shock. Lastly, this orthotic, (4) has a great cushioned top cover. The beauty of this top cover is that it does truly cushion the foot without being so thick as to make the orthotic impossible to wear in shoes. This means the orthotic will fit into a greater variety of conservative shoes. KLM also recognizes that not all people weigh the same. A 250 pound person demands a different type of orthotic than a 110 pound person. This very important issue is never discussed in arch supports sold in stores, magazine and the internet. If an arch support helps the 250 pound person then chances are it will be too hard for the 110 pound person. The reverse is also true; if an arch support helps the 110 pound person then it will be too soft for the 250 pound person. When we make prescription orthotics, next to the actual diagnosis, the patient's weight is the next most critical issue. So if circumstances are such that you need supports and prescription orthotics are not in your budget, at least make sure the particular brand you buy gives you a choice of support based on body weight. If you purchase a support that only comes in one density, keep your fingers crossed and hope that density happens to coincide with your body weight. The next critical issue is the height of a person's arch. 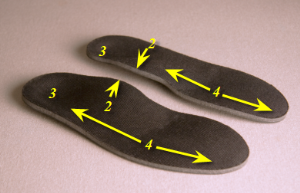 Arch height varies from individual to individual, so the question you should ask in any off the shelf orthotic is, will this device actually support my arch and thereby do some good? The answer is that the top cover of the KLM ORTHOTIC has what is known as a medial protrusion. This portion of the device bends upward in the arch area and will adjust according to the height of the arch. This means there will be a great deal of bend in a high arched foot (to support the arch) and will have very little bend in a low arched foot. KLM Max semi-rigid poly shell provides firm arch support and maximum pronation control. KLM Medium semi-flexible poly shell provides intermediate arch control and medium pronation control. KLM Mild forgiving poly shell provides flexible arch support and mild pronation control. By visiting this site hopefully you have found answers to your foot, ankle and lower leg pain. If the solution to your problem involves the use of an orthotic than I would certainly recommend you try the KLM ORTHOTIC. Like all doctors who treat foot and ankle problems, I am constantly bombarded by every company that offers off the shelf, medical grade, pre-made orthotics. I have yet to find a better pre-made orthotic than the KLM ORTHOTIC, for the simple reason that this orthotic has the capacity to relieve the majority of foot pain in the broadest range of individuals in terms of the various types of foot structures and body weight that a person may present with. tired feet and legs syndrome-do you do a lot of walking and find that your feet and legs become tired, usually sooner than anyone else that you happen to be with? Do you also find that when you stand for long periods of time, your back begins to hurt? The major cause, (but not the only cause) of this condition is due to overuse of your leg muscles from excess motion in your feet. This orthotic may be very helpful in alleviating these conditions. Probably the best thing about orthotics is the fact they are a very safe and effective way to treat many foot and leg problems; there is no medication, no side effects and in my practice they are the treatment of choice for many of the conditions I see. They work by attempting to "re-balance" the foot and more evenly distribute body weight in such a way to alleviate pain. Of course, oral anti-inflammatory medication, cortisone shots, physical therapy and surgery are also part of my treatment regimen, but I have found in many instances orthotics either eliminate or reduce the amount of medication that I have to administer and certainly over the years has eliminated the need for surgery in many individuals. It is a win-win situation for my patients. 1. If your shoe size is a half size order the orthotic size at the next smallest size, because if you order it to the next larger size it may not fit length-wise in all your shoes. 2. If you weigh over 150 pounds I would recommend the MAXIMUM firmness for all foot conditions. 3. for heel and arch pain I would recommend the MAXIMUM firmness regardless of your weight. 5. for diabetic foot protection, and flat feet either the MILD or MEDIUM firmness unless you are over 150 pounds. 6. for all other conditions the MEDIUM firmness unless you are over 150 pounds. 7. The KLM ORTHOTIC will fit in all athletic shoes, boots and most casual shoes. The only exception would be high style dress shoes. The price for the KLM ORTHOTIC is $37.95, plus S+H, closer in cost to store bought arch supports but closer in quality to a prescription orthotic. Additionally, I am offering a 60 day no questions asked return policy (one pair limit). Why 60 days? Simple, many foot problems take time to heal and although some foot conditions will dramatically improve as soon as you start wearing a good orthotic, other foot problems may take longer. The time period is predicated on a number of factors not limited to the problem alone, but also things like daily activity, work requirements, shoe selection and body weight. So, if after 60 days your foot pain is no better than before you tried the KLM ORTHOTIC, simply return the orthotics to me (they MUST be returned) and we will refund your money, shipping charges not included. So, what have you got to lose, besides your foot pain? So...how effective are these orthotics? We started selling them in 2008 with our money back guarantee, and to this point, the return rate is less than 4 percent. That speaks wonders about the effectiveness of these orthotics. Click the BUY NOW button below to order now--Risk Free! The orthotics arrived four days ago and I slipped them into my shoes immediately. I was skeptical as to the usefulness of the item, they really didn't look very exotic. I have to say though, after using them for just four days, I have experienced grand relief from my foot pain. Even the very first day, I was able to do a lot of work while on my feet with at least a 75% reduction of pain. It has only gotten better every day, and I go nowhere without my shoes with the orthotics. I had been experiencing extreme heel and sole pain for about six months and had to take extended breaks off my feet many times a day as well as regular doses of Ibuprofen. Since getting the orthotics, my life has returned to normal and I feel good again. Just wanted to say thanks for the recommendation for a very effective item, I had no idea what a change this item could affect. Yes I want both pair of orthotics. You don't have an option of ordering 2 at one time so I had to place the order twice. Thanks. My husband likes these and wants to put them in all of his shoes. Thank you so very much, that would be much appreciated. I love those insoles, by the way. Thanks so much. Just spoke with Maria and gave her info Can't wait to try new metatarsal pads. These KLM orthotics have been a LIFE SAVER!!! I LOVE your KLM orthotics! They support me better right from the start than my very expensive custom orthotics from California! I have paid $200/pair for many years and they always needed adjusting and padding before they could be somewhat comfortable. Yours were just right the very first time I wore them. I now have two pairs! Your price is so good that I feel quite luxurious being able to order a pair for each pair of my shoes! Many thanks for a wonderful product! I have recommended them to my twin sister and my niece. Greetings. The new pads (metatarsal pads) seem superior and the inserts have definitely helped ease the pain in both of my feet. Thanks for a good product. I received the replacement orthotics (and thanks for marking “R”) and have tried them and am very happy with them. Much appreciate all of your help!.